I have always been a fan of good quality Swords and Sorcery stories. Robert Howard started that with his Kull and Conan stories. 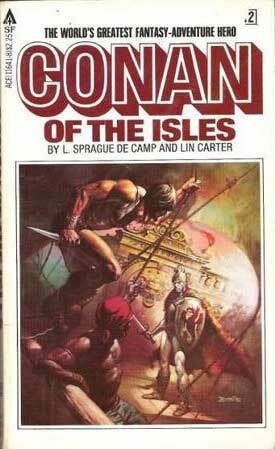 The genre continued with Lin Carter's Throngor tales, Michael Moorcock's Stormbringer sagas, and -- unfortunately - it then often deteriorated into generic rubbish written by people who didn't understand the basics of what they were writing. What was that? Well, for one thing, that straightforward doesn't mean dumb or ineffective -- unless you're writing a parody of the genre. Conan was straightforward, but if you read the stories Howard wrote you can see that he was also intelligent, adaptable, sensible, decent -- and surprisingly kind-hearted at times -- when it didn't interfere with his survival. A hero/ine can be straightforward without being a brainless idiot. A barbarian in the swords and sorcery context simply means someone who doesn't live in a city or on settled farmland, but rather in a harsh and unforgiving landscape -- and no one survives in that sort of landscape by being a reckless idiot. Or your barbarian may be nomadic for some reason -- and a heedless fool doesn't survive traveling through constantly changing landscapes either. The need to endure in new backgrounds is not one that is survived by those who don't learn quickly; adapt fast -- and who have the intelligence to do both. The other part of the genre is that landscape. It should be two things; it should be richly realized and fully fleshed-out as a genuine world. If some names and areas are half- recognizable from history then that's good. It makes it more believable. And the other thing about it is that it should have an air of ancient secrets and mystery. Ruins half downed in jungles, or deep in the heart of deserts, strange gods, weird jewels with unknown powers, shadows that flit eerily across the moon as the hero/ine looks upwards. And then there are the plots in which there are tasks to be done, the helpless to be saved, the wicked to be punished, and the deaths of the innocent to be avenged. Real, genuine, honest swords and sorcery stories aren't always just entertainment, many are small morality plays, and if they're well enough written, they can make you both laugh -- and cry for the pain that the characters suffer. Howard could do that. And the really interesting thing that I found with this book, is that so can Michael Ehart. The book's main character is Ninshi, originally a young girl, until she and her equally young lover were tricked into taking an amulet from a dying man and going in search of treasure. The lover ended up trapped out of time, she ended up as the servant of the Manthycore, killing people to feed it, and wandering endlessly over ancient lands to do so, never aging, and alone. Until Miri, a child slave, comes into her life and joins Ninshi in her travels. Basic swords and sorcery, a solid reason why the main character wanders, a believable sidekick, a villain that is only half villainous, more something that is merely living up to its nature, and then -- an excellent quest, since Ninshi is given hope that if she finds the seven jewels of Ishtar, they can be used to buy information to free her and her young lover from the Mathycore's power. Of course, in the end things don't go as was hoped or planned but the ending is still solidly satisfying to the reader. It resonates strongly with Ninshi's character as portrayed, and provides an ending that still allows the reader hope that the author will return with further Ninshi stories. It is possible that I'm praising this book more highly than other readers might agree with, but to my mind, it is fully up to the standard of anything that Robert Howard wrote. And I LIKED Ninshi. I liked Miri too, they played off each other very well, and the growing friendship, trust, and quasi-mother/daughter relationship between them was a gentler contrasting thread through all the deaths and destruction of the stories. These tales have it all, excitement, adventure, good common sense, (Ninshi isn't a reckless fool despite being almost unkillable) and she hasn't become deadened to emotion despite her centuries of wandering. She can still listen to the need of a child and respond. She can still regret many of the deaths she has, and will continue to, cause. I bought this book and paid out my hard-earned cash for it, and -- you can't say better than this -- that payment was justified. And if the author writes another book, I'll buy it sight unseen, based on the story-telling qualities of this volume. A "keeper" if ever there was one. I haven't read the book yet, Lyn, but I love your review! As familiar as I am with Michael's stories and Ninshi herself, I snapped up a copy as soon as CW sent her announcement. Your review has encouraged me to move it higher in the TBR stack.